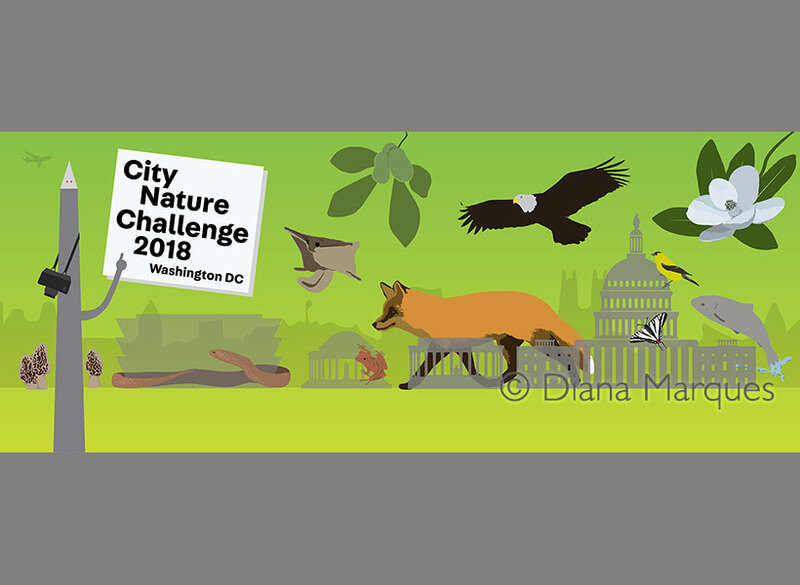 The City Nature Challenge 2018 Washington DC is part of a worldwide competition that involves 60 cities trying to make the most observations of nature, find the most species, and engage the most people in urban environments. Thousands of citizens from across the globe get outside and document the biodiversity in their cities, by snapping photos and uploading them to the iNaturalist online platform with a note of the location where they were found. They suggest the identification of the species, and other citizens and experts on the platform verify. Every observation can contribute to biodiversity science, from the rarest butterfly to the most common backyard weed, and all the data is shared with scientific data repositories. 2018 was the second year Washington DC participated in the challenge and the banner illustration created for the official website and iNaturalist project page was used across multiple participating groups that organized events for the occasion.